The next edition of the Social Enterprise World Forum will take place in Addis Ababa, Ethiopia in October 2019. 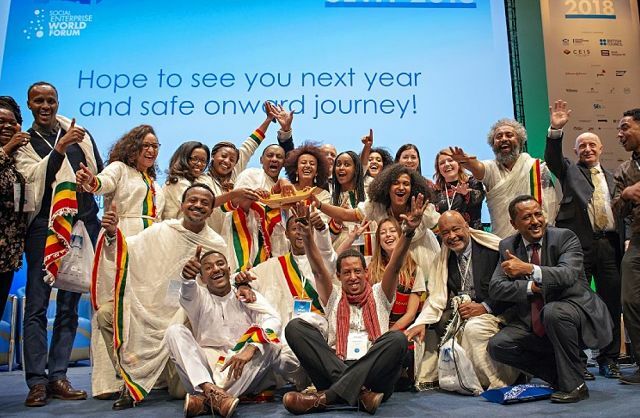 Addis Ababa was announced as the event’s next host city in an exuberant handover ceremony at the conclusion of the 2018 Forum in Edinburgh. This will be the 12th annual forum and will be the first time it is hosted by a lower income country. The SEWF is the world’s leading forum for international exchange and collaboration in social entrepreneurship and social investment. In 2019, the aim is to catalyse the area’s dynamic social enterprise movement – both within Ethiopia and more widely across the Africa, and spur the further growth of social enterprise globally to help address social problems. Members of the social enterprise movement from all the other continents will be there too, learning from each other and sharing their experiences. Kibret Abebe, Chair of Social Enterprise Ethiopia , a social enterprise support body which was created at the end of 2017, said he was delighted that Addis Ababa won the bid to host the forum. With over 100 million inhabitants — it’s the second most populous nation in Africa after Nigeria, Ethiopia already boasts an estimated 55,000 social enterprises, according to British Council research published last year . Some of the most well-known examples include Tebita Ambulance , founded by Abebe, and Whiz Kids Workshop , founded by Bruktawit Tigabu. Both Abebe and Tigabu were in Ediburgh where they spoke about their highly impactful work in a plenary devoted to the ‘Best of Social Enterprise’. However, Abebe pointed out that the concept of social enterprise was not yet widely recognised and saw an enormous opportunity to raise awareness of business with a social purpose: ‘We want to really bring this idea into the minds of the public and more widely,’ he said. ‘Harnessing this enormous population of entrepreneurs, innovators and talent is critical in order to spur the growth of social entrepreneurship globally, as it generates employment, reduces inequalities and addresses entrenched social problems,’ he said.